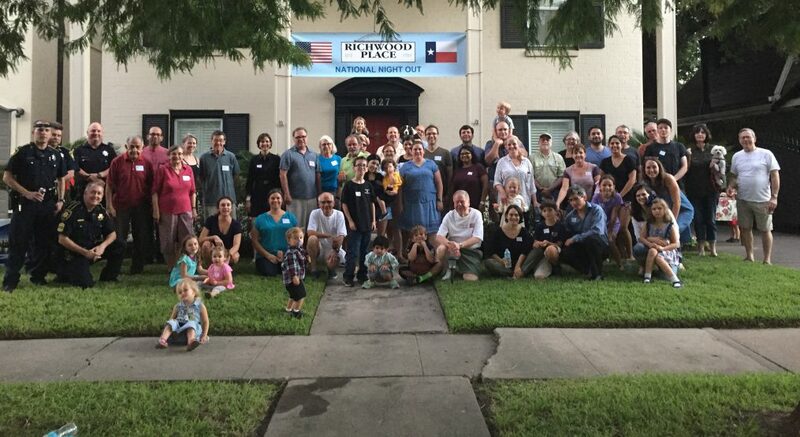 RICHWOOD PLACE CIVIC ASSOCIATION (RPCA) is once again partnering with Trees for Houston to plant Live Oaks throughout our neighborhood. During the winter of 2012 we planted 7 30 gallon live oaks along Norfolk between Hazard and Woodhead. They are looking great! If you would like to plant one or more live oaks in your front yard or sponsor a live oak planted elsewhere in Richwood Place, you can pay for that here or come to National Night Out and you can select the location there. We will have a map of the neighborhood showing where we would like to plant trees. The cost of the tree including planting, staking and mulching is $95 ($99 online). You do not have to be a RPCA member to take advantage of this offer, however if you are a current member of the association, you can receive a $25 discount off of this already discounted price ($75 online). Join us in the 1800 Block of Norfolk tomorrow night for National Night Out from 6-8pm. We will have a sample tree there for you to see. As well as a visit by the HFD and entertainment by Allen Oldies Band. I just caught this on the morning news. Today from 8:00 AM to noon, Trees for Houston has trees for all Houstonians, just in time for Arbor Day! For a suggested donation of $10, you can choose four-foot-tall or larger tree. Then, with a little work and care, you will soon have something beautiful that can be enjoyed for generations.